In July 1855 the Western Times reported that an old halfpenny had been found in a garden adjoining the town of Ashburton. It was inscribed Taunton 1657. 'As you occasionally insert engravings of medals, etc., I enclose one (fig 8) which is reckoned a great curiosity. Many diligent researches have been made for the token at, and in the neighbourhood of, Ashburton, in vain; nor do I believe one of its kind exists but with me, except the British Museum may boast the possession. 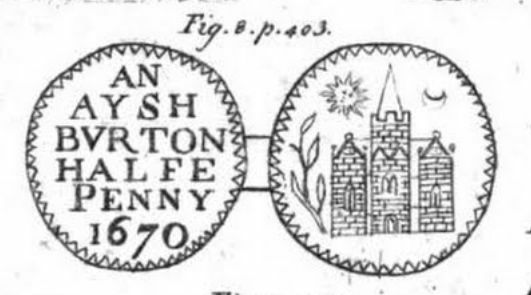 Ashburton tokens, with the maker's name, are in the hands of many. 'The tokens of Devonshire are numerous. Three towns issued nearly half the number, namely Exeter 57, Plymouth 24 and Tiverton 18; they are principally farthings. Town pieces were struck by Ashburton, Axminster (? ), Bideford, Dartmouth, Moreton Hampstead and Torrington. R[everse]. (no legend) - a church, sun, crescent, branch with acorns* and a saltire; the Arms of Ashburton. 2. O. ROBERT. JEFRY = R.G.I. 3. A variety has the Queen's head crowned, in place of the Initials. In 1817 a notice in the Exeter Flying Post announced a list of places where the new silver coin of the realm would be exchanged for the old. In Ashburton the coins could be exchanged at Brown and Co. Throughout this site there are references to the money used in this country before decimalisation in 1971. Below is a short explanation of some of the coins in the 19th and 20th centuries. A pound, written as £1 or occasionally 1l*, could be in paper form or, for most of the period, could be a gold sovereign, as shown in the top row. Half a penny was a halfpenny, and a quarter of a penny was a farthing (middle coin bottom row). There was even at one time a half farthing (bottom row right). Next to it is a two shilling piece, or florin. Then comes the shilling, and next to it is a sixpence. 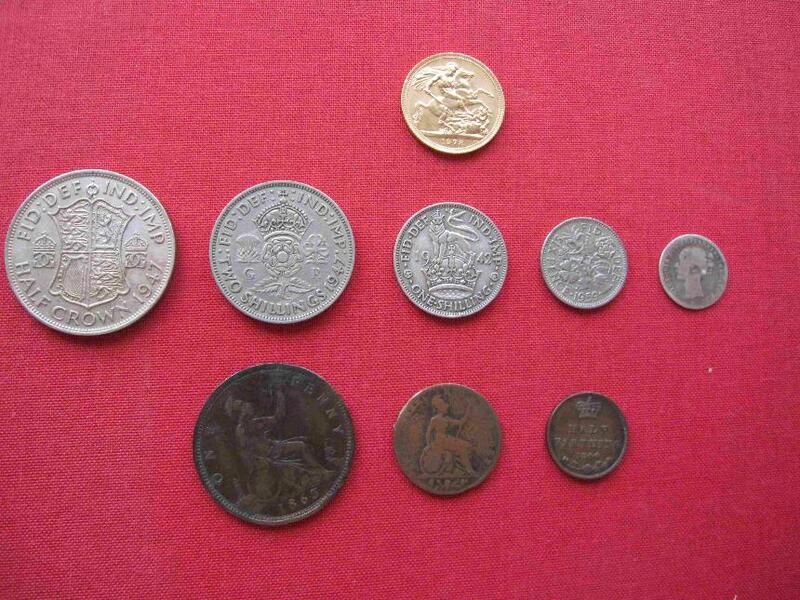 The middle row extreme right shows a silver threepenny bit. 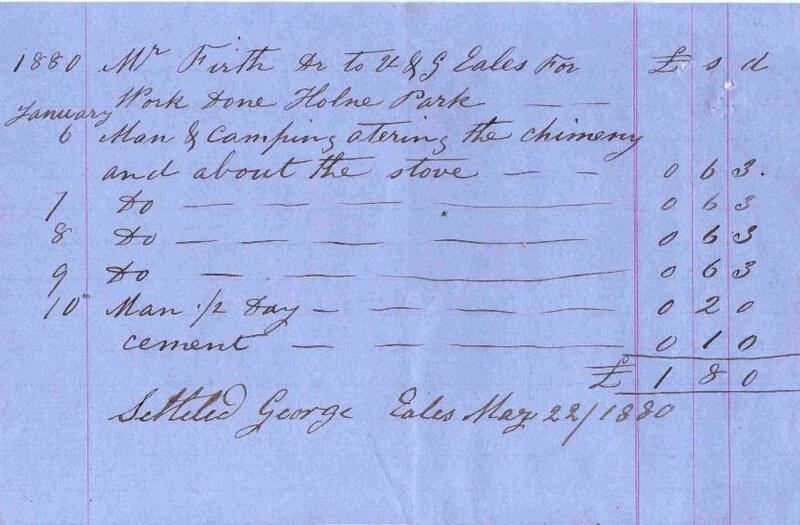 For examples of what things cost in the middle of the 19th century, see Prices at Ashburton market, November 1848, in the Markets and fairs sub-section of Gathering together. Many thanks to the owner of the above coins (who wishes to remain anonymous) for allowing me to photograph them.